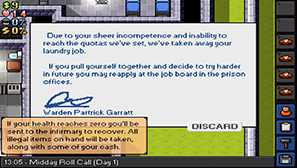 In The Escapists you have one objective; escape. You are an inmate in prison for an undisclosed amount of time, too long for your liking anyway, and you need to concoct and execute a method for your desired freedom. This is considerably harder than you may imagine. The prison abides by strict rules and routine and you need to be sneaky and organised to get anywhere. And more often than not, you'll find yourself back at square one. The biggest obstacle you'll encounter is the routine of the prison. There is a timer and a strict series of activities you are required to be present at; be it the three rollcalls in a day, the three meals, exercise, shower or work. In fact (unless you don't have a job), the only time you have in a day to begin working towards your objective is the free time. Everything moves incredibly fast in this prison, and as you begin you'll find yourself not having enough time to get anywhere. It is easy at first to be overwhelmed by the sheer pace and movement of the game, getting caught up in the routine and failing to find anything useful to your cause or even know what you are supposed to do. This does get more manageable as you become accustomed to the game, but it does take some time. You need to keep your extra curricular activities cyclical in order to succeed. You have three stats: strength, speed and intelligence. Strength is increased by lifting weights (mashing Q and E continuously) and increases your health. Speed is gathered by spending time on the treadmill and intelligence gained by reading books in the library. You'll need to keep all of these as high as possible (they decrease over time); when you get to beating inmates and guards alike you need to do as much damage as possible, as quickly as possible and intelligence is required for crafting the items you make to attack with. Attacking someone when your strength is lowered is a folly; you'll almost always lose and end up in the infirmary. 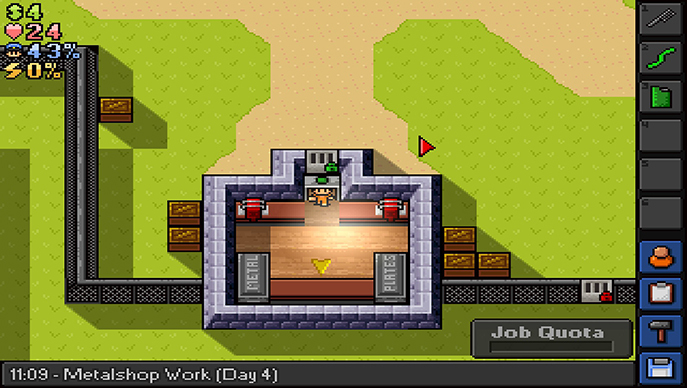 Crafting plays a big part in The Escapists. There are several ways to gather items. The main way is to walk into any cell and search the drawers there and loot whatever you want. 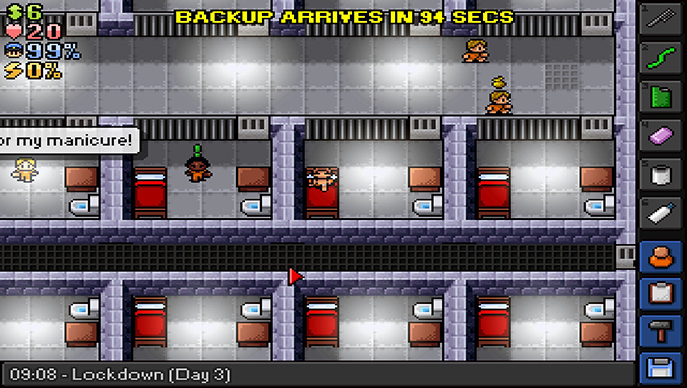 This seems like a bit of an easy way out gameplay-wise as there is rarely consequence for doing so, even when a guard or inmate is nearby and I'm pretty sure cells wouldn't be left unlocked. You can hold six items at any one time but can stash things in your own drawers. Crafting is a mixture of experimenting, thinking logically (comb plus razor blade is a pretty obvious combination for a makeshift weapon) and using directions from crafting notes that are sparingly spread across the prison. Crafting is vital in your escape plan, as far as I can tell there is no other way to acquire the necessary items. Your fellow inmates sometimes have favours to ask of you – side missions – from which earn you money. These range from finding an item, beating someone up or distracting the guards. The money you earn can be spent buying items from certain inmates that have a gold symbol flashing over their head (I didn't realise this till about day fifteen; it is a little unclear that clicking on them then pressing a tab would bring up a shop interface). The other way you can make money is in a job. There are currently three jobs available: laundry, timber and metalwork. You start with laundry and I was fired after my first session (wasn't aware of how fast time moved yet and how long the washing machines took to finish), but shortly after I began metalwork which is easily completed long before the next stage of the routine. This gave me a little extra time in each day to gather resources and further my plan. One you feel comfortable with your stats and your items it is time to execute your plan. It is definitely not as easy as having everything you need and going through the motions. My first attempt went thusly: made a makeshift shiv, waited in the showers for a guard to come by, attacked him and knocked him out, stole and wore his uniform and truncheon, walked out to the front gate hoping to be let out as a guard. Nope, I was shot. This put me back in the infirmary with all of my carefully gathered contraband confiscated. This is a potentially frustrating part of the game. You must be sure that everything you need – items, stats, location, positions of other people – are all good enough. If you start a plan but one of the guards defeats you because all of a sudden they do more damage than before you'll lose everything you've gathered and crafted. And then you'll need to perform the whole routine again; rummaging through cell mate's drawers (the items in them are randomised) until you've got what you want, then read some books to boost your decreased intelligence stats to allow you to craft the necessary items again. This happened several times to me and wore a little thin; especially as you still have to comply with the demanding routine. The pixel art is nice and functional and the audio in the game works really well to create an atmosphere. This atmosphere is lost a little through the nonsensical non sequiturs that guards and inmates alike spout. Random sentences such as “You'll treat me as your king”, “I switched genders” and “It's like my mother said” just don't work. I'm not sure if it's an attempt at humour but it completely fails and clashes with the atmosphere the music and strict routine creates. I'm not sure the word 'switched' is appropriate in that context either, especially as the majority of these sentences are intended as humour for the player. 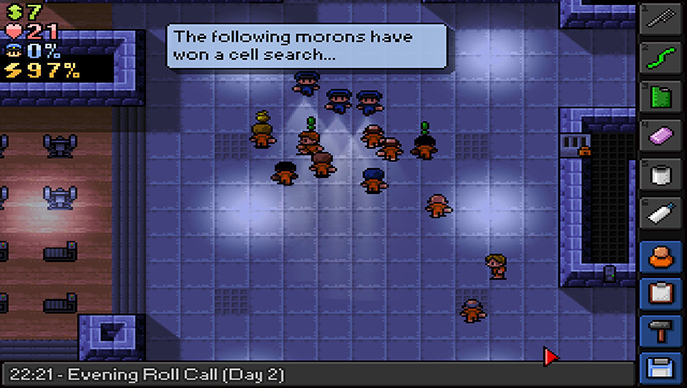 As an early access title The Escapists is very polished and feature rich. I've not found any major bugs, just a couple of small quirks. I had a guard standing next to me that randomly fell asleep, sometimes you'll have to click on something two or three times to activate it and when fighting the popup showing their name lies over their health bar, making it impossible to see. This made it hard when still trying to figure out the fighting mechanics. 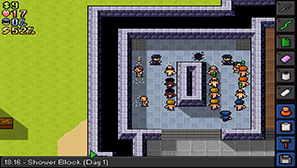 The Escapists is a casual sim about escaping prison that, despite some slight tonal confusion, is engrossing to play. I'm not sure I'd say it was a lot of fun to play but for the most part it works. The solutions to make an escape are challenging and layered and working alongside the routine while plotting for your freedom is difficult. 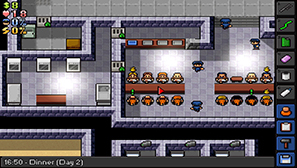 At the moment there is one prison and scenario but more are intended to be added. I will play until my escape is complete but until there have been a number of updates I am satisfied that I have fulfilled my time with the game. 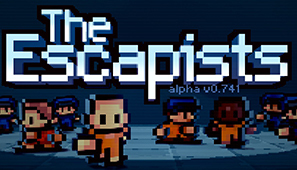 The Escapists won't blow you away, but if it sounds like something you're interested in you'll likely have a good time with it. I can say it's worth the price already, and it can only be good if the developers add as much content as they've stated they want to.